This recipe is straight from the Food Network cite...Thanks Rachel Ray!!!!! Crusty bread, to pass at the table Add extra-virgin olive oil to the pot, 2 turns of the pan. Add garlic and crushed red pepper flakes, stir then stir in the onions, carrots, celery and zucchini. Cook 10 minutes, then add in the stock, tomatoes and beans. Bring soup up to a bubble and season with salt and pepper, to your taste. Simmer 5 minutes. Turn off the heat and wilt the basil into the soup. 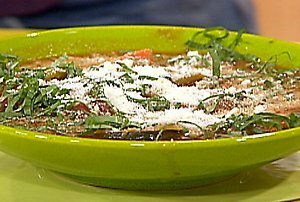 Ladle up the soup and serve with grated cheese and bread.